From the outside, the wardrobe looks neat and clean. But when opened, the contents of the closet are very messy so unsightly. In order for the messed up content to not damage the appearance of the closet as a whole, it should be tidied up immediately. This is also important for the comfort and cleanliness of the cabinet owner. Here are easy tips for tidying up the contents of the wardrobe. If indeed the contents of the wardrobe are very messy, try removing all the contents. Then, choose clothes that are still in use, then separate them with clothes that are already small or are not worn anymore. This step of sorting clothes is important because it can be a mess because of the many clothes that are no longer used. After sorting, place clothes that have not been used in a container. Don’t put it in the cupboard again, but throw or donate clothes that are still suitable for use. That way, cabinets can leave room for other clothes and you can share them with those who need them. For clothes or other items that are still in use, try to arrange them by sorting them by size or type. After that, separate by color. This method will make it easier for you to look for items and clothes to wear. In addition, this method will also make the inside of the cupboard look more unique and attractive. After sorting the clothes and arranging them according to size and color, the next step is to choose and use a hanger or a good hanger. This is so that the hangers are not easily damaged and also damage the clothes that are stored by hanging. Then, place clothes that are often used in a place that is easily visible and taken and put clothes that are rarely used on the inside. That way, when you want to take clothes, you will not damage the existing arrangement. 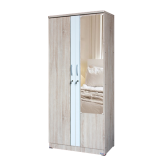 The LPT 011 wardrobe from Lunar Furniture is the right choice for your wardrobe needs. With this wardrobe, you will be able to store your clothing collection more easily and neatly. Call 021 54376 555/333 or click www.lunarfurniture.com for more information.